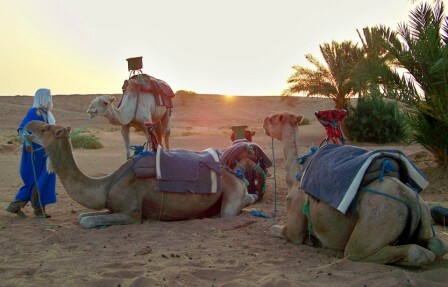 Four Day Desert Circuit by Camel - Adventure Tour of Moroccan Sahara. 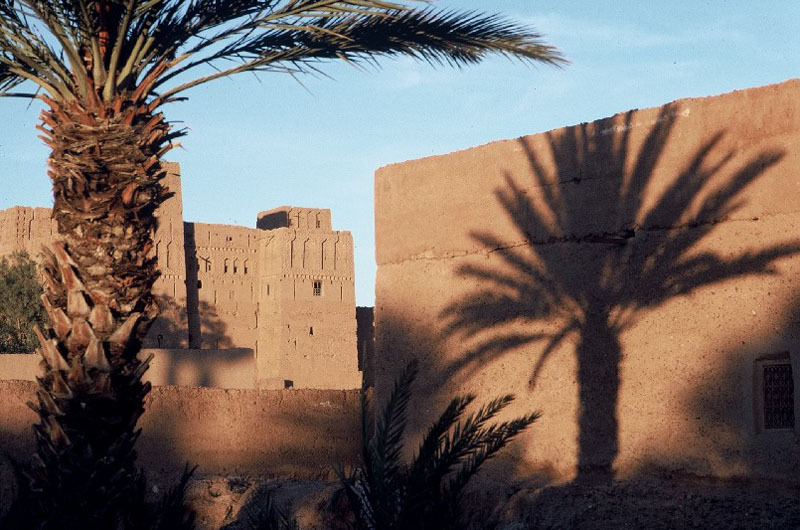 The Sahara feels like such a distant image from Marrakech but with Rediscover the World a visit to the real desert of Morocco's deep south is a reality. 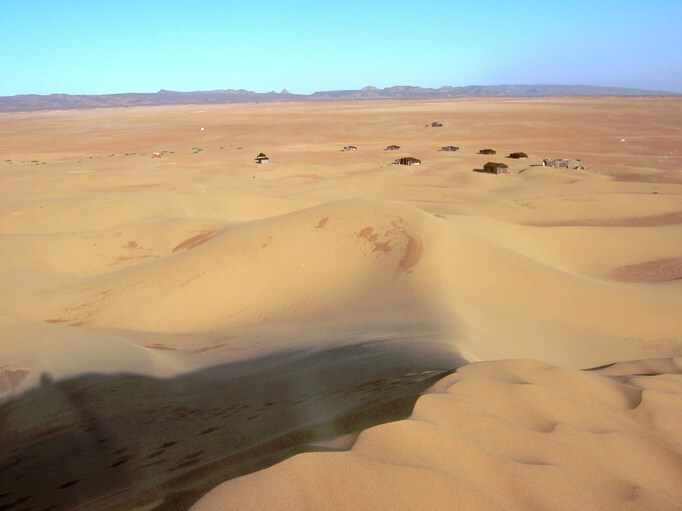 The nearest section of the Sahara is just a little south of Zagora and it is in this region that we offer this extended meharee of four days. 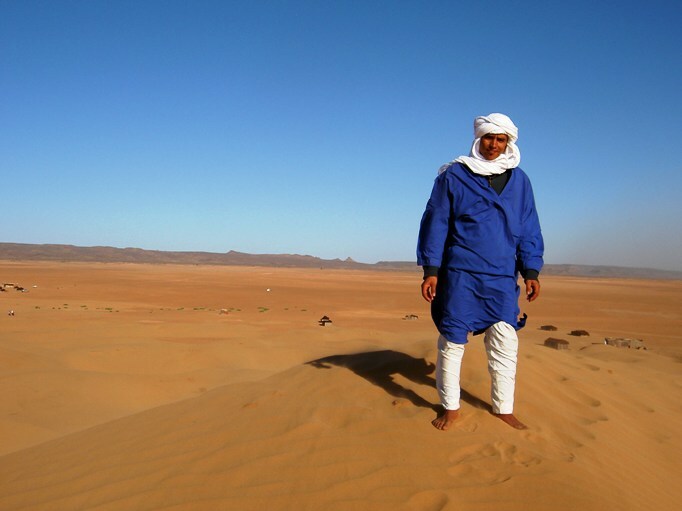 Slow your pace, get away from the crowds, experience the nomadic life for a few days in the southern region of Morocco. 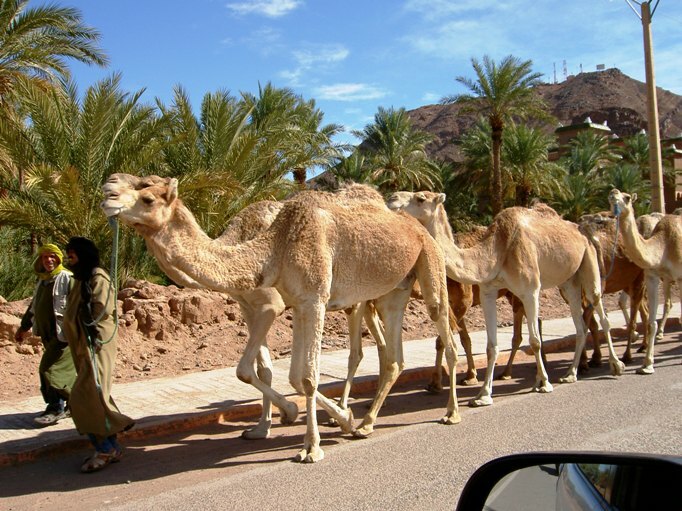 This itinerary is the only one with multiple days riding on camels and visits places not included elsewhere. From your hotel or riad in Marrakech your journey will begin across the Glaoua Plains and up via the winding road over the High Atlas Mountains through the Tizi n’Tichka (2260m). From this high point you will see a dramatic change in the countryside - from high mountain ranges to semi-desert and oases. 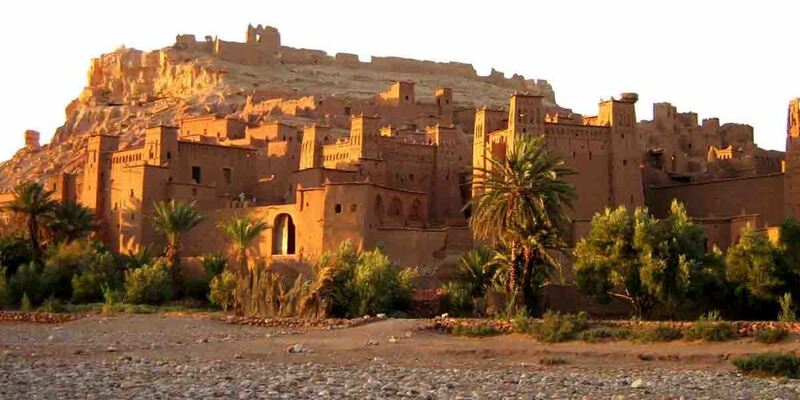 Either outbound or on your return you will stop at the magnificently exotic ksour of Aït Ben Haddou, declared, and rightly so, a World Heritage Site; here Hollywood has shot many of its films, including, as everyone will tell you, “Lawrence of Arabia” and "Gladiator". Further south to Ouarzazate and down the beautiful Drâa Valley to the small kasbah-like Hotel Fibule Du Drâa in the oasis town of Zagora. 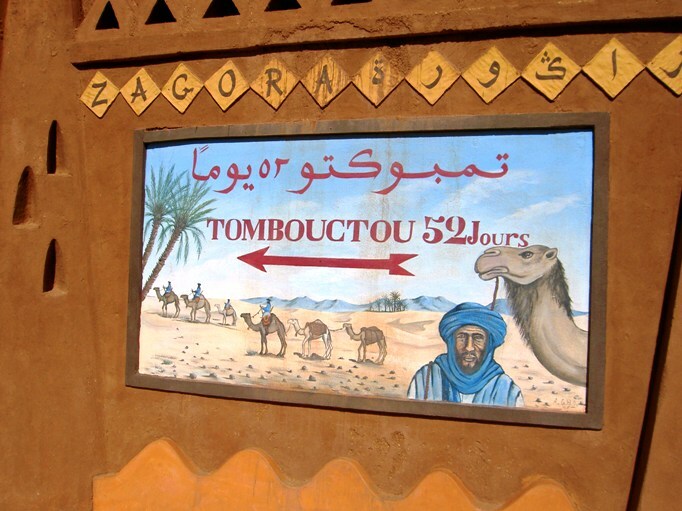 From Zagora there is a choice of places to stay overnight and we include Bedouin camps at Bou Attache, Oulili and Erg Lihoudi (the latter one having a deluxe option). The sunsets and sunrises in the rarefied air of the desert can simply take your breath away, the nights may be spent in our carpeted, nomadic tents or out in the open under an awesome canopy of the starlit heavens. All travel to and from the desert is by air-conditioned, 4WD vehicle, most meals and sightseeing are included and, crucially, there are multiple meharees (camel rides) into the desert with overnight stays in traditional Bedouin tents in beautiful and peaceful settings. All our desert trips are based on including private transfers from Marrakech; please contact us to arrange accommodation - we are experts for small hotels and riads across Morocco. visit of Ouarzazate and the Ksour at Ait Ben Haddou. extra dinner served by a waiter in traditional costume. Departing from your hotel in Marrakech at 6:45am at the latest, set off south in an air-conditioned Land Cruiser 4WD over the Glaoua Plain to cross the High Atlas Mountains via the fabulous Tizi n'Tichka Pass (2260m). From this high point continue down alongside the Oued Ouarzazate to the ex-French Foreign Legion town of Ouarzazate and on for 100 miles through the delightful and dramatic Draa Valley until you arrive at the small, charming kasbah-like Hotel Fibule Du Draa in the Amazrou Palmeraie of the oasis small town of Zagora, where you will have your midday lunch of tagine (soft drink included). Time to relax around the swimming pool before setting off with your guide/chamellier at 2pm (September to May) or 3pm (June, July & August) (you’ll have noticed by now that the dates in this region are amongst the finest you'll ever find) for an adventure of some 4 hours towards the south-west into a desert interspersed with the black gravelly 'Reg' stretches and the small dunes of the El Fajia Plateau in the Nebch region, isolated enough to let your imagination take hold. 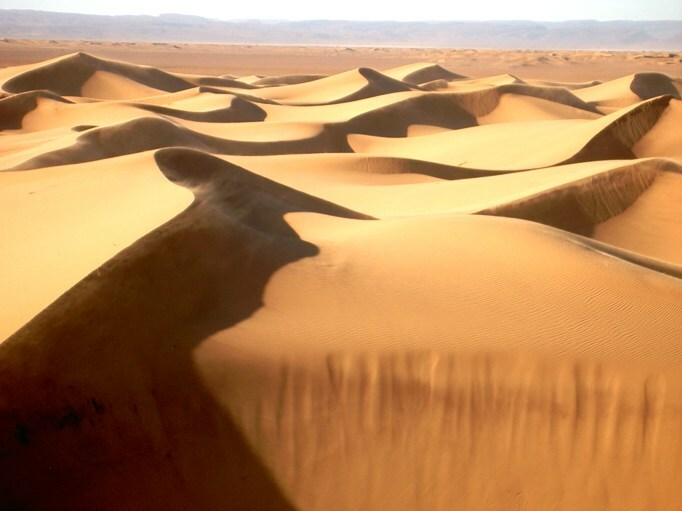 As the air has heated up, the winds have risen to make the sand swirl about, you’ll notice that older dunes appear darker, for the iron in the sand has finally oxidised. 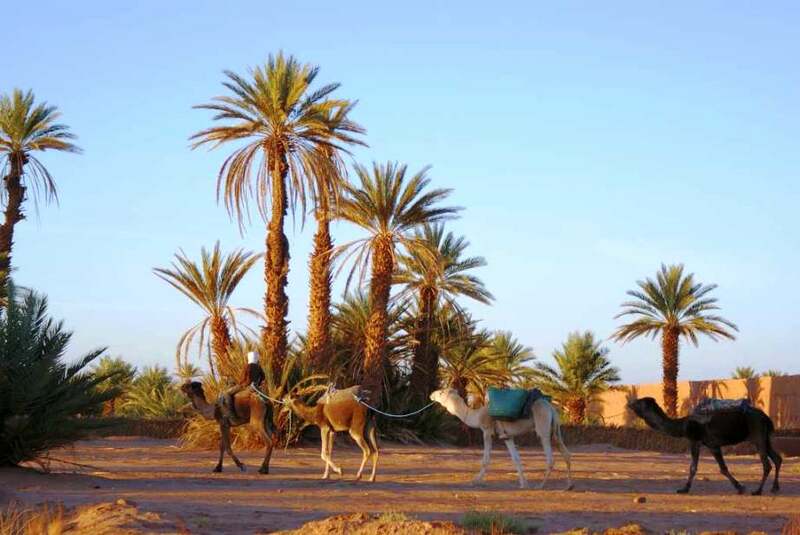 Here, some 20km from Zagora, the low range of the stark, mineral and fossil-rich Jbel Beni hills to the south, is your camp for the night in a carpeted Bedouin tent at Bou Atacche and, after a welcoming traditional tea ceremony, your dinner of tagine with fruit, bread and mint tea will be served. The sunsets and sunrises in the rarefied air of the desert can simply take your breath away, far more than the hot air has done, so far. This night may be spent in a nomadic tent or as you prefer out in the open air under an awesome canopy of the starlit heavens. Awakening to the splendour of a Saharan sunrise, tuck into a Bedouin breakfast of tea, milk, sand bread and cheeses whilst the dromedaries are being saddled for today's meharee further towards the south. 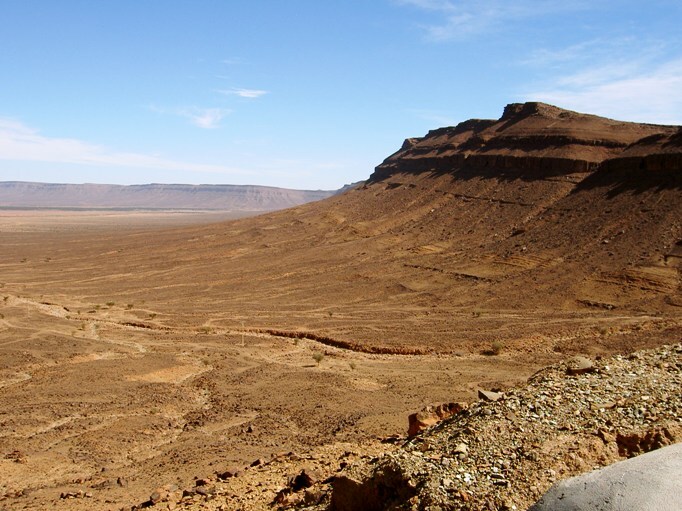 After some 4 hours across Reg and small sand dunes, the occasional isolated acacia trees breaking the vast horizon, you will reach the acacia woods at Djenia, where your guide will prepare a field picnic in the foothills of the Jbel Bani. 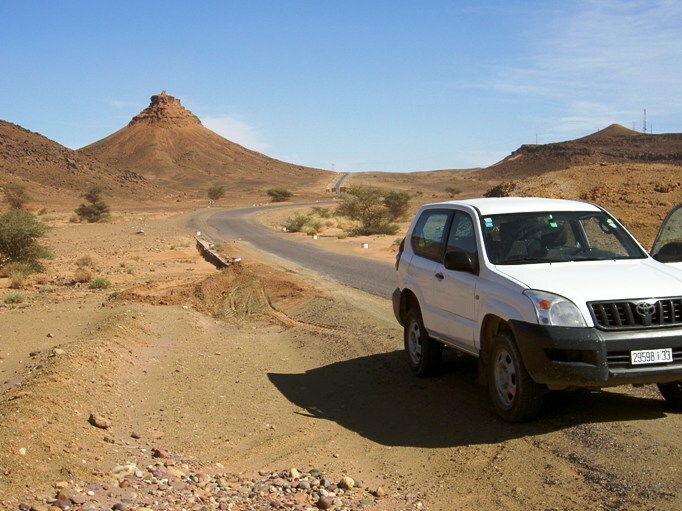 Once refreshed, cross the sun-and-sandblasted Hassi Djenia (the 'Devil's Bowl') and go up over the Tizi n'Djenia col (1095m). 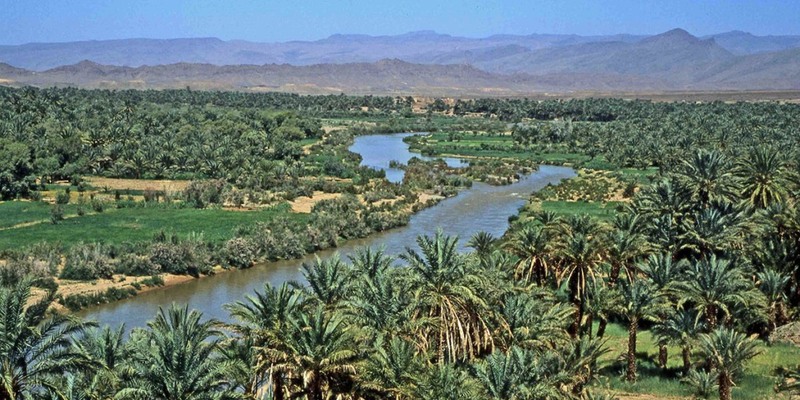 Once across, you will enter into a picturesque stretch of small oases, passing between the hamlets of El Fha and Hassi Elagba El Bida, (the 'White Slope in a Bowl') to arrive after some 6 hours at the bivouac site at Oulili adjoining some vegetable fields of the Ait Isfoul Berber tribe. 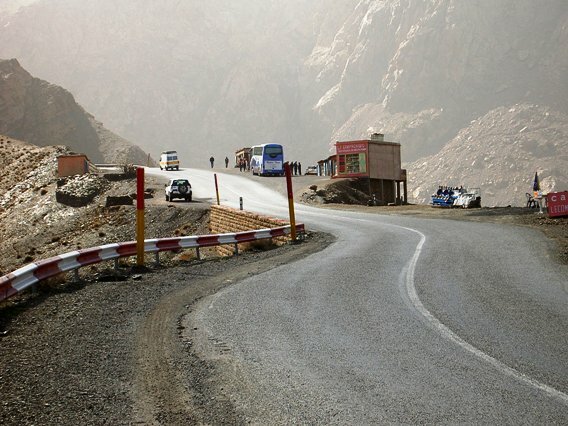 Whilst your evening meal is being prepared, glass or two of mint tea in hand, perhaps you'd like to bear in mind that the two days' ride so far would only have taken 1.5 hours by car- by the shortest route. But you now know what you would have missed! A simply fabulous sunset; a different panorama, but the same unforgettable spectacle of Nature showing off. DAY 3: OULILI - OUZIT N'BRAHIM OU ALI - ERG LIHOUDI. Sunrise ! Breakfast in an awesome vista in every direction of brightening heavens and the changing colours of the sands as they chase the sun's elevation. The dromedaries are being saddled up for today's venture ever towards the south; riding for some 3 hours towards the dunes at Ouzit n'Brahim Ou Ali, where you'll make a stop for your field picnic. Refreshed and midday siesta over, set out for a further 3 hours towards the impressive dunes of the Erg Lihouidi where there is a [classic] bivouac site (optional upgrade to 'deluxe') and dinner for this the last night of your adventure. 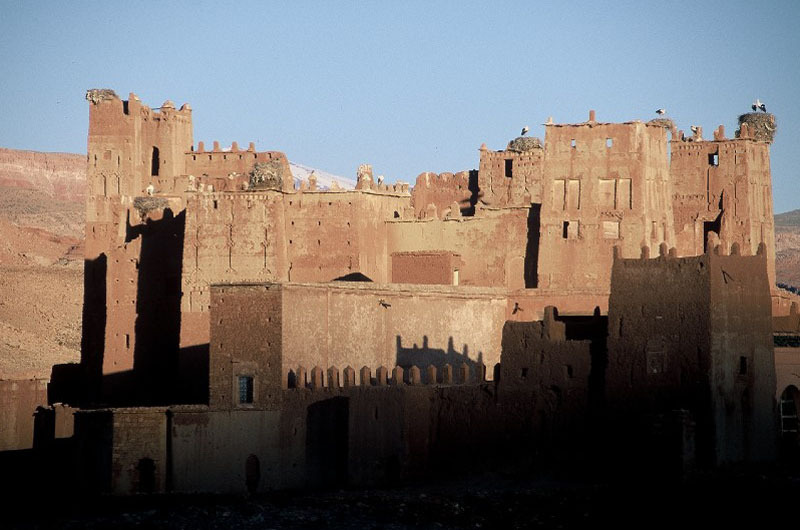 DAY 4: ERG LIHOUiDI - TAGOUNITE - AiT ISFOUL - TAMEGROUTE - AiT BEN HADDOU - MARRAKECH. Having witnessed an awesome sunset the night before, now is the hour for an even more startling sunrise before your Bedouin breakfast of mint tea, bread, jams and cheeses, after which, your ships of the desert saddled up, you'll somewhat reluctantly strike off back towards the north-east and relative civilisation. An almost 2 hour long dromedary meharee covering some 12 miles of Hamada arriving around 10:00 - and now only 50 Days To Timbuktu - to rejoin your 4WD at Tagounite, some 11 miles north of M’Hamid, to drive right at the trailing edge of the Jbel Bani across the dunes of Ait Isfoul and through an oasis via the nearby ancient and remote Jewish kasbahs of Beni Hayoun and Beni Sbih. Back now onto the tarmac road at Tagounite and on to an unusual tightly-knitted grouping of ksours and still-inhabited underground kasbahs; this is the ancient village of Tamegroute, a seat of learning since the XIth century, with its Library of XIII century illuminated Koran scrolls written on gazelle hide, some works of Pythagoras and some original maps of Alexandria, together with some very early mathematics text books; a - voluntary - contribution to the upkeep of the Library is always appreciated. Why not continue your stroll through the alleyways of the underground kasbah to the ancient pottery co-operative just outside of Tamegroute, to see pottery being produced, as it has been for centuries, in the simplest of manners, in the simplest of kilns. If you have ever been to Fes, or have seen photographs of this Imperial City, here in Tamegroute you'll see the famous green glaze associated with Fes's tiled roofs, for the founders of the XVIIth century Abou Ben Naceur "Naciri Brotherhood" in Tamegroute invited craftsmen and potters to this remote area with the intent to turn it into a thriving caravan hub city. Onwards now to the Fibule Du Draa, perhaps to take a shower before continuing on your way back up north for some 14km off-road adventure in the Valley of 1000 Kasbahs and on to Ouarzazate in the Draa ('Black') Valley and the remarkable UNESCO World Heritage Site of the Ksar at Ait Ben Haddou. Your driver will make a stop here for a light lunch at the Restaurant Haj Tibou before continuing on over the Adrar N'Dern Mountains to arrive quite late at your hotel or riad in Marrakech. 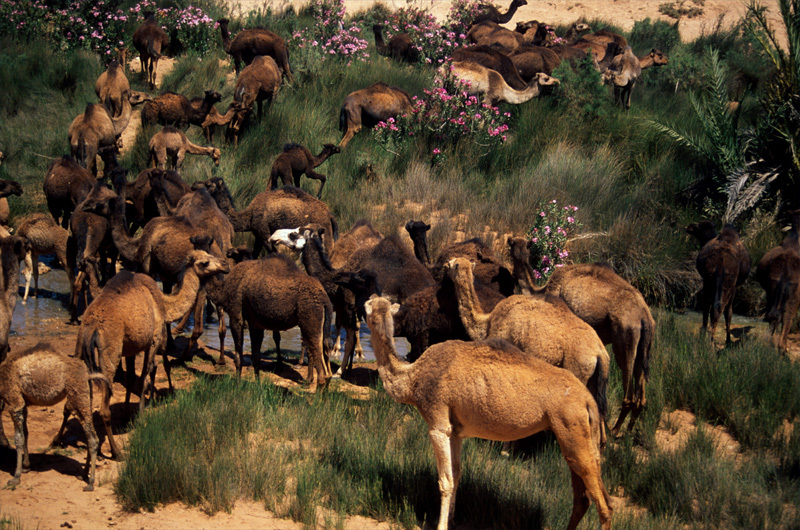 Fully-inclusive Sahara excursion by 4WD & camel meharee from Marrakech. 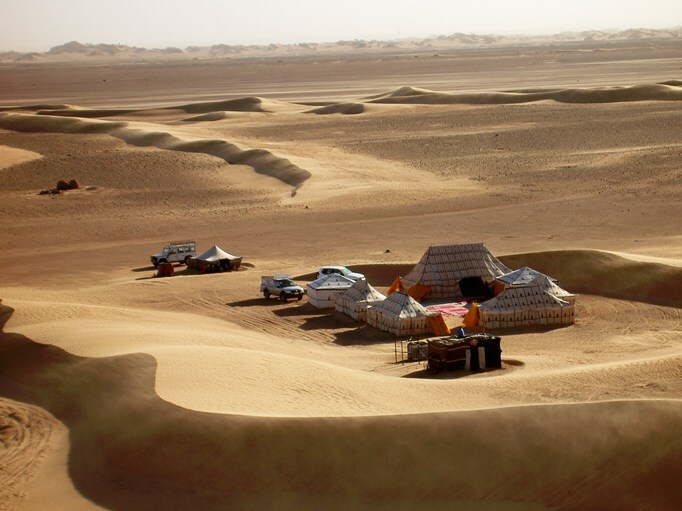 Overnight at THREE desert camps; all meals, sightseeing, accommodation & activities included.